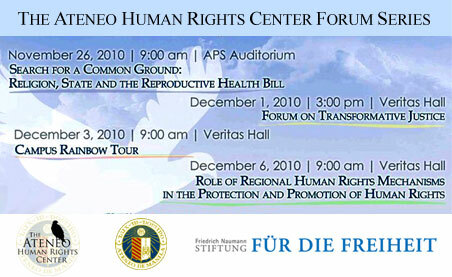 Two months of programs on various topics concerning human rights, including those on provocative issues such civil and political rights, and reproductive health, capped the Friedrich Naumann Foundation for Liberty (FNF) Philippine Office 2010 activities. Opportunely, these activities will be followed through with a public forum with the German Commissioner for Human Rights Policy Markus Löning in Manila on 21 January 2011. Every year, FNF Philippines replicates a program of the International Academy for Leadership (IAF). IAF is the training institute of FNF in Germany. On November 21-24, 2010, a seminar on Civil and Political Rights was held in Cebu. In partnership with the IAF Alumni Group and the University of San Carlos (USC) College of Law, a three-day activity was organized and attended by 30 human rights advocates coming from different sectors - NGO and civil society workers, law practitioners, academicians, media and government workers. Read more. The Ateneo Human Rights Center (AHRC) with the support of FNF held a series of fora leading up to Human Rights Day. Four meetings were organized to discuss relevant issues and educate the public on their rights and their role to safeguard these for their individual selves as well as for the community. The Reproductive Health Bill was deliberated before an audience of 250 people composed of religious groups, civil society organizations, and students on 26 November 2010. Dr. Alberto Romualdez, former Secretary of the Department of Health and Vice President of the Forum for Family Planning and Development, Inc.
“While they did not necessarily give the stance of their religions as regards the reproductive health bill, they gave the audience a clearer picture of how reproductive health rights figured in different religions,” said Atty. Ryan Quan, AHRC Internship Director. It was acknowledged that while there is no single version of the reproductive health bill in the lower house of Congress, the movement for passing a regulation is getting stronger. The importance of reproductive health rights was highlighted, not only as regards women’s rights issues, but also in terms of population control and its impact to development. It was also pointed out that more than ensuring the future generations’ right to life, their right to a quality life must be given attention. The need for transformative justice was emphasized at a forum on 01 December 2010. The “culture of patriarchy, corruption, and impunity” was identified as hindrance to the efficiency of the judiciary. “The disregard for the rule of law, indifference to gender sensitivity, and lack of concern for human rights have often caused miscarriage of justice and has led to the public’s dwindling trust on the judiciary,” noted Atty. Adoracion Cruz-Avisado, a former judge and the author of book The Intertwining Culture of Patriarchy, Corruption and Impunity: Journey in Advocacy for the Transformation of the Justice System, which was launched at the forum. Atty. Avisado underscored the need for truth seeking amidst the corruption in the justice system in the Philippines. “Justice has become a commodity, and how this has made the fight for justice even more difficult, if not futile. Corruption must be addressed in order to slowly bring back the people’s trust in the justice system,” she said. To further promote gender equality and gender mainstreaming, a forum focusing on the rights of an emerging marginalized sector in society – the lesbians, gays, bisexuals, and transgenders (LGBTs) was organized on 03 December 2010. Discriminatory acts against LGBTs are often disguised as jokes. One of the objectives of the forum was to make people understand the gender differences, and more importantly, respect one’s choice and individuality. A wider approach to push for human rights safeguards was discussed on 06 December 2010. The activity seeks to learn from the experiences of the Inter-American Commission on Human Rights (IACHR) in human rights protection and promotion these can be applied to surmount the challenges in the ASEAN region. The ASEAN has its own Intergovernmental Commission on Human Rights (AICHR). Only one year after its establishment in Oct 2010, AICHR continues to develop. Mr. Santiago Canton, Executive Secretary of IACHR stressed that pushing for a stronger regional human rights mechanism would put additional pressure on countries to fulfill their international human rights obligations. He also pointed out that information dissemination is important. “People should know that there is such mechanism and there is a movement to strengthen it. This will heighten the observance, fulfillment, and respect for human rights around the world,” encourage Mr. Canton.